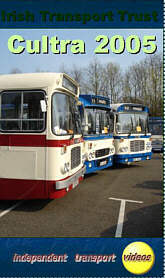 For over thirty years now the Irish Transport Trust have held a bus and coach rally. This year, the independent transport videos cameras attended the event, which took place at the excellent Ulster Folk & Transport Museum, at Cultra in Co. Down. If you think a bus rally is rows of smartly turned out vehicles just standing in a field – think again!! This rally provides plenty of action!! Our programme opens at Great Victoria Street bus depot in Belfast as we board 234 (6234 EZ) a 1963 AEC Reliance with UTA bodywork for the ride to Cultra. Once at the rally site we observe the exhibits arriving and parking up. Vehicles come from all over Ireland with some visitors from the mainland UK and also brand new vehicles fresh out of the Wrightbus factory prior to delivery to their operators – including First and London. The next section features the owners and drivers taking their vehicles through a driving skills test, which gives us plenty of time to examine the vehicles as they move in and out of cones and white lines! We then experience the road run on board preserved Leyland Leopard 235 (WOI 2235), which incidentally went on to win the Ludgate Trophy, awarded for best overall vehicle at the Rally, in the guest judge’s opinion. A circular tour through the beautiful Ulster countryside, on a pleasant, sunny day, brings us back to the rally site after a 40 mile trip. After a brief visit to the Museum to see the ‘bus’ exhibits, we see the preparation for the prize giving and then the vehicles depart for home. As a postscript, we visit two previous rallies at Cultra, seen through the camera of Richard Shannon. A very interesting event, featuring old and new vehicles, this video is a nice record of the day, and of a well organised event. It will certainly make you want to pay a visit next year!